When the 10th richest man in the world is brutally murdered along with his prized Borzoi dogs in a luxurious Easthampton beach house, only one man is suspected of the crime: Juan Suarez, a handsome, charismatic—and illegal—Mexican immigrant who worked for the victim. Now, renowned trial lawyer Raquel Rematti must take on the defense of the man the media has dubbed, "The Blade of the Hamptons." Not only must she navigate a media circus to take on one of the wealthiest families in the world, she must protect Suarez, and herself, from ruthless people bent on lethal revenge; while straddling the dangerous line between concerned involvement and forbidden passion for her client. "Paul Batista has done it again. Through the eyes of criminal defense attorney Raquel Rematti, you'll see the criminal justice system laid bare. The book is truly 'shock and awe.' A must read." "The Borzoi Killings is one fine book indeed, keeping you on the edge of your seat from beginning to end. Just when you think you have it all figured out, Paul Batista surprises you again and then all over again...right up to the last page. Hold on to your hat—you're in for a great ride!" 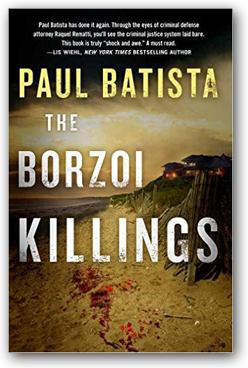 "The Borzoi Killings is Paul Batista's newest entry into the world of high-powered murder/courtroom mysteries. From the brutal murder that leaps off of the first pages, through the twists and turns of the investigation, and the drama of the trial, Batista channels an insider's knowledge of crime and punishment, together with a craftsman's creation of compelling characters, into a page-turning, thrilling, and ultimately shocking journey. A must read!" "Paul Batista did it again! This is another well-written murder mystery thriller with so much intrigue and detailed character development. This was a truly great read with surprising twists coming when you least expect them. This superb thriller is set in one of the most exclusive places in the world—East Hampton, New York—and in Manhattan. It begins with the murder of the 10th richest man in the world and his two Borzoi dogs; and then shifts to the arrest and trial of a handsome and illegal Mexican immigrant represented by one of the best criminal defense lawyers in the United States, the complex, sensitive and powerful Raquel Rematti. The book is filled with fascinating characters, including the wife of the murdered man and her lover who is a former US Senator, a secretive drug lord, and shady detectives, some honorable men and women, and with trial scenes that are riveting. And I just loved the unexpected ending. I can usually guess what is going to happen in a novel and this one took me completely by surprise! I LOVE that!"